The Portland Loo is now open in Cambridge&apos;s Central Square. When you’ve got to go, you’ve got to go. And if you’ve got to go in Cambridge, you can now go in the city’s newest public toilet, a $320,000 outdoor restroom that was installed in the heart of Central Square. Officials on Monday reminded residents and visitors that the new bathroom, located at the corner of Massachusetts and Western avenues, is officially open for, well, business. “ICYMI the new Central Square Public Toilet ... is now operational,” officials said in a tweet to their 11,000 followers. The toilet was first put in place in October, but hooking up the utilities, testing, and inclement weather delayed its opening until late last month. The toilet is known as a “Portland Loo,” a stainless steel facility that can be used 24 hours a day and is graffiti-resistant, according to details on the city’s website. There are vents at the top and bottom of the structure. It’s accessible to people with disabilities. The arrival of the “flush toilet kiosk” was years in the making. It was paid for through the city’s participatory budget process, where residents decide how a fixed amount in capital funds should be spent. In 2015, those who voted during the budgeting process were overwhelmingly in favor of designating cash for the Portland Loo, which “is easy to maintain and can take a lot of abuse,” according to the company that makes them. A lack of access to public restrooms in Central Square has long left business owners in the area on edge, concerned that people struggling with drug addiction may use the businesses’ bathrooms as places to get high. Similar concerns have been raised about whether the Portland Loo will become a drug haven, according to a WBUR report. “The Portland Loo design with louvers on top and bottom allows another layer of visibility to help with public safety,” he said. This is the second freestanding toilet Cambridge has rolled out for public use. 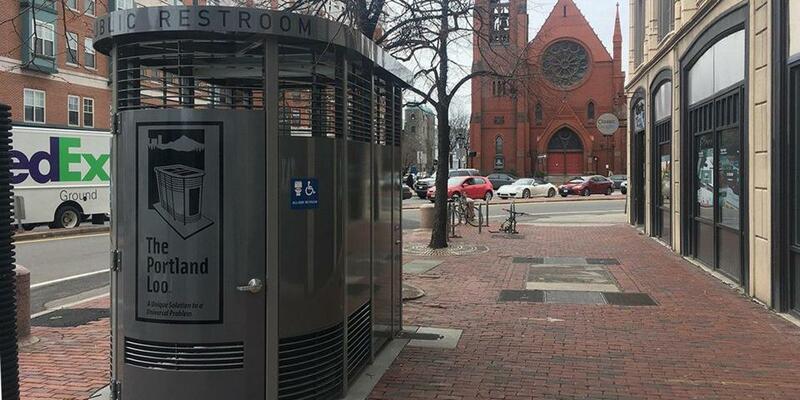 In 2016, a Portland Loo was installed at General MacArthur Park, a small plot of land in Harvard Square that sits along Massachusetts Avenue, across from Church Street and Harvard University. Hailed as the city’s first official outdoor toilet, it appeared in the square after years of research and input from the community.